If you were asking Mark Richt before the season, and you could get him to be honest, he would have told you that winning at Florida State this year would be a massive boost for him and the program he is building at his alma mater. He also would have told you that it was very unlikely to happen. Florida State started the season ranked third in both polls and was widely seen as the class of the ACC. But then they lost. And then lost again. And lost a QB. And, somewhere along the way, lost all their swagger as well. So, now Richt not only leads his Hurricanes into Tallahassee with a legitimate chance at a win but as road favorites. It's a remarkable development. Florida State already has one conference loss. A second would all but eliminate their chances of winning the ACC given how good Clemson has looked. Their backs are against the wall. Will they thrive or shrink under the pressure? What is Miami? It's a good question but a tougher one to answer. They are a public team that has fallen on hard times in recent years, and Richt is a popular and respected figure, so any sign of success and progress is really going to be embraced by the average bettor. But despite the 3-0 start, they have done very little that teaches us much about what kind of team they really are. Like Florida State, the hurricane and its aftermath has meant that Miami has played only three games. They beat Bethune Cookman in the opener, which is totally meaningless in every way. After that they beat Toledo by 22. The Rockets have been lousy defensively, so the 52 points Miami scored don't particularly inspire much confidence. And allowing Toledo to score 30 points isn't great - Toledo has scored a lot of points this year, but they are still a MAC team visiting an ACC squad, so they shouldn't be able to score 30. And then they got by far their best win when they won handily at Duke. The Blue Devils are far from an elite team, but they have wins against Northwestern, Baylor and North Carolina this year, so they are not a bad squad. So, the Hurricanes are just a three-win team that hasn't played an elite team or a strong defense, and they have not had a decisive performance by their own defense. So, is Miami a good enough team to be favored on the road against a troubled-but-talented team? Your guess is as good as mine, because we don't have the evidence to know decisively. And what is wrong with Florida State? That's a big question - how much time do you have? Injuries have brutalized them and forced them into playing a young QB who clearly isn't ready. The running game, which was so great last year with Dalvin Cook in town, has been just plain lousy this year - they rank 122nd nationally in yards per game, which certainly isn't taking pressure off of QB James Blackman. And injuries and a general lack of intensity have led this defense to be mediocre at best. The offense isn't good, the defense is not great, and the coaching staff doesn't seem to have the command or confidence that they have had in recent years. The game opened with Florida State as three-point home underdogs, and it has stayed there through early action. Miami has drawn an overwhelming majority of the betting action at this level - well over 80 percent of bets - so if anything we will see it climb, but oddsmakers are hesitant to move lines off the key number of three, so it won't move in any hurry. The total opened at 48.5 and has dropped a full point in early action. 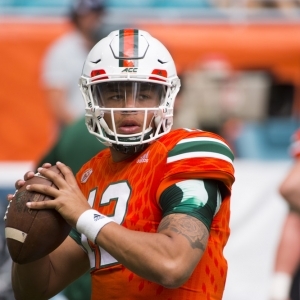 The Hurricanes are 7-1 ATS in their last eight overall and 5-0 ATS in conference play over that stretch. They are 5-2 ATS in their last seven road games but have not covered their last four games played in October. Florida State is 5-0 ATS in their last five games following a straight up win and 3-1-1 ATS in their last five against teams with winning records. The Seminoles are a team in a deep funk. There is no questioning that. Despite that, though, they have to be the pick here. Miami hasn't proven themselves to be worthy of being favored in this tough spot. Neither side of the ball has been dominant, and that is against a schedule that is fine but not brutal by any means. Florida State was improved last time out, they are at home, and Blackman is only going to get more comfortable with more reps. A home underdog is always worth a look. When that home dog has the talent that this team does, and was seen as the third best team in the country just a month ago, they get the benefit of doubt when playing a team that has not yet been proven to be elite. The Seminoles and the points are the right play. I definitely would want at least three points, but at this point I'd wait for a while to make the play in hopes that it goes to 3.5.